When my sister started school a whole new avenue of friends opened up for her, one of these was a girl called Lorraine who befriended my sister. We were constantly being bombarded by my sister about the exploits of this Lorraine, so it was no surprise when my sister was given a new teddy bear at Christmas that she should name it Lorraine. Now you might think it odd that she should be given a new teddy at her age, but we must remember life was a lot simpler in those days and the pleasure that bear gave my sister was immeasurable. However, from then on we had no idea whether she was referring to her friend or her teddy so someone came up with the bright idea of prefixing the bear’s name with fluffy, so Fluffy Lorraine the bear became. At first glance at this photograph you might be forgiven for thinking I’m holding the pushchair containing the bear, but if you look closely you will see I actually have a string puppet in my hand. Now I have to say, at that age, I was a little co-ordinationaly challenged, I was hopeless with anything that needed physical manipulation, balls for example, I could neither throw nor catch, just how did I get through my education years avoiding doing either of those? I digress, I wanted a string puppet and subsequently had one for Christmas, but really I had no clue as to how to use it. Whichever string I pulled Popeye always seemed to make the same movement, and then there was the problem of entanglement, you only had to put it down carelessly and the strings became tangled. I seemed to be forever attempting to sort the strings, or my father was. Eventually I cut some of them off leaving just the head and arms connected which did ease the problem and Popeye’s movements were no more or less accurate than before, in fact just the same. Fluffy Lorraine went home again. Although I retain much trivia in my memory, I might add it was my sister who yesterday reminded of this rhyme. The photograph is from an album in my sister’s possession and one I don’t ever remember seeing before. There are more stories to come from the contents of this album, be warned! 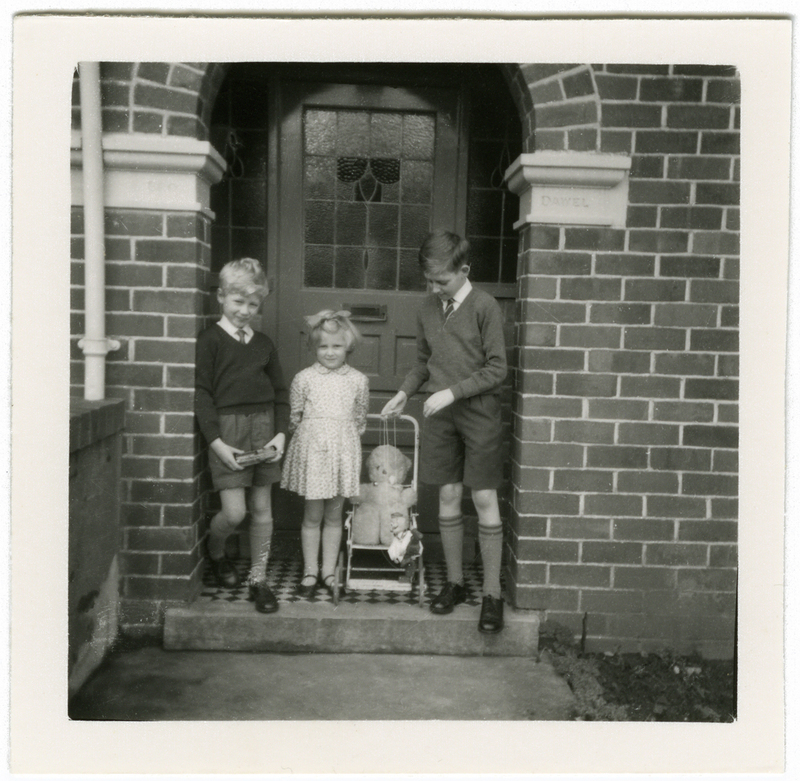 I must know – does your sister still have the bear? And what’s your brother holding? Funnily enough, I have an association with Popeye, in that I was always drawing him in secondary school in the early ’70s. In, fact, I became quite famous for it, and classmates were always asking me to “Draw Popeye, draw Popeye!” As a collector of toys (and other things) I have a few Popeye items of merchandise in my collection. Incidentally, I’ve added your blog to my list, so hopefully a few more people will visit it as a result. Thanks for adding me to your list Kid, much appreciated. Popeye probably isn’t around any more but the bear is, and every other soft toy my sister had or accumulated throughout her childhood and beyond. In my brother’s hand is a Dinky Toy Chipperfield’s Circus crane; I think I have that now, but can’t check as all toys are in store pending my move.